This was a sweet game, but I was surprised at how short it was. I was expecting the process of gathering the ingredients to be a little more involved and not limited to one map. The visuals were pretty cool and the flying parts were nicely executed. One harmless bug you might want to look into - if you hit escape to look at the menu, you see a face that looks nothing like the main character and three other party members. I assume players weren’t meant to see this? A little rough around the edges but a nice effort and the ending was nice. Adding to things others have said, when the girl talk, it shows full character's body, if it were like up around waist, it would be better. Obviously this game not finished, but with some more work it will be good. So keep on working! 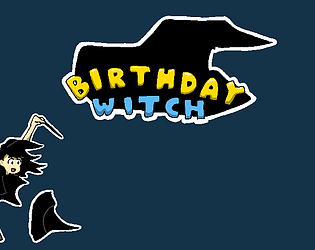 Did notice a few things to edit; The witches back is missing a white outline. The sentence when you first go downstairs needs editing. You can actually still access the menu. To disable that you just need to use the command on the third page of event commands "change menu access". You can walk over all of the graves. You do have some places where tilesets are not working quite right since they can clip over your tall character etc. I would possibly suggest using Yanfly's doodads. They've got a 'same as character' layer so you can walk under and over them without noticeable clipping.
. This guys needs a direction fix to stop him disappearing. There was a mix of mapping styles and the left-right walk looks strange when traversing a top-down view map but it didn't spoil the experience, maybe just something to avoid mixing in the future. If you want to make isometric maps, I'd suggest looking into a pixel movement plugin. Rhino, first of all, thank you so much for writing such a long post for my submission, I will take everything you've written to heart. It really means a lot to me that someone actually played through this game, even though it ended up like this. My vision was to create a game for the IGMC that contained no combat but was entirely quest based using Yanfly's Quest Journal plugin and containing some kind of broom flying mini game. I had a really good start creating some tiles and sideways walking animations, however after some time there was trouble at my IRL job and suddenly I had almost no time at all to work at this submission. I was really sad to not being able to complete it in time as it would've been my first game. On the last day I still decided to submit what I had and I spent a couple of hours putting the game together and wrote all the dialogue and events in a rush. I intended to have the witch have different animations for every direction of course, including up, down and diagonal, but I copy pasted what I had instead. Made a still of her facing up in a hurry. Bug testing as good as I could, the graveyard map I spent no time on at all as you've might have guessed, at that time it was 2AM and I had a working day the next day so I was completely exhausted. Right before hitting the bed I submitted the game and uploaded this misaligned picture... I figured that no one would notice the game at all, it just felt good for my own sake to have completed the submission at least. I was sure the game would be lost among all the amazing submissions to the IGMC. With that explanation out of the way I just want to say thank you from the bottom of my heart for your kind words and suggestions! I am happy that you could look past the flaws and still somewhat enjoy what I managed to create. This was my first game and even if you're the only one to check it out it makes it all worth it for me after knowing that someone actually played it. I now feel motivated to keep creating things in the future. Thank you, Rhino!